Select Event Category from the [Categories] drop-down list to view all events from that category! Applications close: Monday 25 March 2019 (unable to negotiate on this). ALL payments must be made by the Monday, 25 March 2019, otherwise application may be cancelled. Ages: 10-17 Overview Leaving by boat from Half Moon Bay on Friday evening, and return Sunday afternoon. Accommodation will be the old American Army Barracks, now the Motutapu Outdoor Adventurer Camp, located right on the beach. Food will be provided, as well as mattresses, hot showers and toilets! Sabbath will be a special program involving worship and activity. But from Sunset Sabbath the adventurer really starts! A Rogaine with markers all over both Matutapu and Rangitoto islands for you to find and collect in your team. This is intended to be suitable to anyone who is interested, regardless of their ability, fitness or experience in the outdoors. Rogaine Challenge This allows the competitive Pathfinders to set a significant challenge for themselves, while those more social Pathfinders can also participate and enjoy closer parts of the course while strolling along the beach and through old army bunkers and other natural or historic features. Teams will be awarded either Participation (just patch) or “B” grade (Patch with silver star) or “A” grade (patch with gold star) based on how many points they achieve during the Rogaine. Markers are valued based on distance, complexity or other factors. Teams (4-8 Pathfinders plus an adult leader per team) Large Pathfinder clubs attending are welcome to put in multiple teams! This gives you the chance to grade your teams to have competitive or advanced teams and more social or beginner teams. 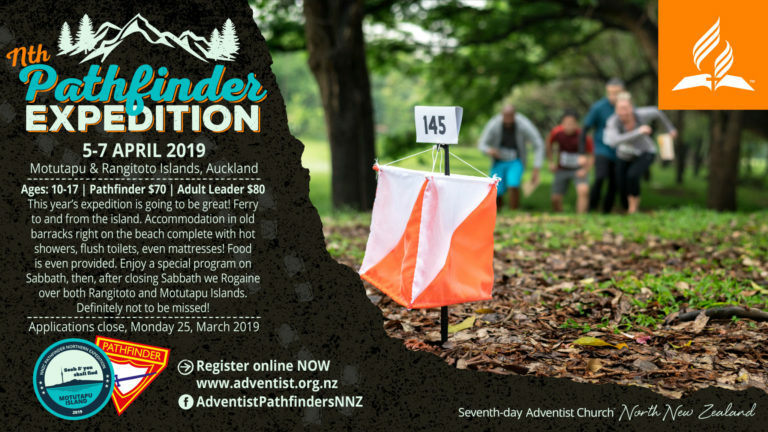 If you don’t have enough Pathfinders from your club attending or are a teen who does not belong to a club, you can join with another club, or contact Dale Hokin and he will look to put a couple of mixed teams together. What to Bring Clothing, hat, sunscreen, sun glasses and insect repellent. Water bottle or blader (min 2ltr pp). Wet weather gear. Day pack for Rogaine challenge. Sturdy footwear. Towel and toiletries and swimmers if you wish to swim. Cutlery, cup, plate and bowl. Sleeping bag and pillow Group gear (min one per group): First aid kit, Compass. Costs Pathfinder $70. Adult Leader $80 (1 to 4-8 Pathfinders). Additional leaders will need to contact Dale Hokin to ensure sufficient space on the trip (boat and bed spaces are limited to 110) and they will need to cover a higher percentage of their costs. Cost includes 2 x ferry trips (on then off the island), dorm accommodation, hot showers, flush toilets, and food provided!